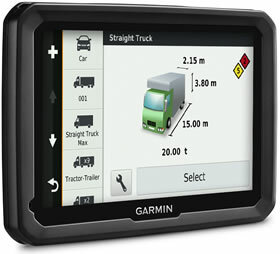 The Garmin dezl 570LMT-D truck satnav is preloaded with Full European maps and Digital Traffic Information. The maps are free to update for the lifetime of the product and the traffic information is subscription free. There is a large 5 inch screen and an enhanced speaker. There are 2 models available which are with or without Digital Traffic using DAB digital radio. The Garmin dezl 570LMT-D allows you to enter the profile of your truck and then the satnav will only route you along suitable roads for your vehicle. Points of interest specific for truckers such as truck stops, weigh stations, parking, lodging, WiFi connection hotspots and more are included. Multi-stops can also be entered in to the Garmin dezl 570LMT-D plus you can enter roads and cities you would like to drive include along your journey. Garmin dezl 570LMT-D has been discontinued. The Garmin dezl 570LMT-D is a truck satnav that features a large 5-inch touchscreen so you will always have the perfect view of the screen when driving your lorry. Full maps of Europe are included and these are free to update for the lifetime of the product. Furthermore, lifetime traffic is included with the Garmin dezl 570LMT including possible detours to avoid traffic congestion all for no subscription fee. The dezl 570LMT-D will also display estimated arrival times. Garmin dezl 570LMT-D is a premium truck sat nav designed for drivers of trucks, lorries, oversized vans and other large vehicles. As well as trucks it also has other vehicle modes - making the dezl 570LMT-D a perfect partner for caravanners, motorhoming and even car drivers too. There are two models available of the Garmin dezl 570 which are either with or without digital traffic. Both truck satnavs include traffic but only the dezl 570LMT-D includes digital traffic using DAB digital radio. The Truck Profile feature enables you to enter the profile of your truck so you are routed along appropriate roads for your truck. Specifically, you can input the dimensions, weight and load type into the dezl 570 LMT-D. Another great feature is easy-switching between truck profiles by simply storing different profiles in the Garmin dezl 570 LMT-D. You will also receive road warnings for sharp curves, bridge heights, weight limits descents and inclines. The Garmin dezl 570LMT-D includes Points of Interest relevant for truckers including truck stops, weigh stations, parking, lodging, WiFi connection hotspots and more. Further POI's include restaurants, shops, services, petrol stations and more. The speaker on the Garmin dezl 570 LMT-D has been enhanced and is now louder meaning you will always hear the voice prompts. On screen information includes Garmin Real Directions such as navigation that features landmarks, buildings and traffic lights as a reference to where to turn. Furthermore Easy Route Shaping feature enables you to choose preferred roads and cities to include in your route. Active Lane Guidance provides voice prompts and brightly coloured arrows to tell you which lane you should be in at each junction. Furthermore photoReal junction provides real-life junctions on-screen so you can see where you will be turning at complex road junctions. Additionally, Birds Eye junction photos display overhead views of junctions on the screen of the Garmin dezl 570 LMT-D.
You can program in 30 multi-stops along each journey. Plus you can enter 15 multiple journeys. These features make it easy for delivery drivers to find muliple locations whilst taking the shortest, most economical route. You can use the Garmin dezl 570 LMT-D with your smartphone to make and receive calls by syncing the Garmin satnav with your mobile phone using Bluetooth. Hands-free calling is made possible using integrated microphone and speaker utilising the enhanced speaker volume. You can also make conference calls with the Garmin dezl 570 LMT-D. In addition the dezl 570 LMT-D is compatible with a Bluetooth headset to make and receive hands-free calls. The clock on this GPS Garmin satnav changes automatically for different time zones and it includes sunset and sunrise times plus it will also identify country borders. Premium content such as weather and safety cameras is available when the Garmin 570 is connected to a smartphone. The Garmin dezl 570LMT-D is also compatible with the Wireless Backup Camera which is sold separately. The Garmin dezl 570LMT-D, like all Garmin sat nav's, gets its speed camera data from the Cyclops speed camera database. The database provides advanced alerts to fixed, average speed, mobile, variable, temporary roadwork, red light and red light speed cameras. As you approach a camera, your device sounds an alert. Subscription charges apply. Click here to read more about the Cyclops speed trap database. Furthermore the Garmin dezl 570LMT-D has a speed limit indicator built in that will tell you on screen the speed limit for almost every major road across Europe and the US. Do you have a question about the Garmin dezl 570 that's not been answered on this webpage? Please see our sat nav FAQs for questions from other customers and visitors. Plus if the answer to your question isn't featured, use the online form to ask us for the answer. Alternatively please telephone 01733 777623 Monday to Friday (9:30am-5:00pm) to speak to one of our sales team. ‣Trucker Points of Interest: Petrol stations, truck stops, weigh stations, WiFi connections and more. Garmin dezl 570LMT-D is powered via the supplied 12/24 volt vehicle power cable, the unit is then mounted on the windscreen via the supplied suction cup mount. Alternatively fix to the dashboard using the the supplied screw down mount for Fixed dashboard installation. We do not recommend using a third party charger with this product. A mobile phone USB charger or a laptop may not be powerful enough to reliably charge the Garmin dezl 570LMT-D and may provide an incorrect voltage or insufficient power. An official genuine Garmin AC charger is available for indoor use with this product you can view and buy here. 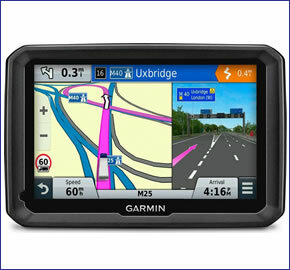 Garmin dezl 570LMT-D comes preloaded with detailed City Navigator street maps for Europe provided from map supplier 'here'. Rolling screen transition, accelerated map redraw and routing capabilities make screen zooming even smoother and ensure the navigation always matches your pace. If you'd like to buy additonal maps for another region e.g. North America or Australia and New Zealand. These can be viewed and purchased via the dezl 570LMT map page. Looking for accessories and spares for the Garmin dezl 570? 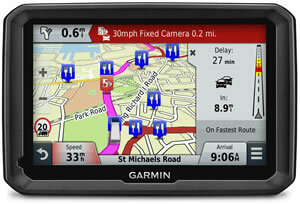 All parts are genuine Garmin product and specifically designed for use with the 5-inch dezl 570 truck sat nav. Parts include a vehicle reversing camera. 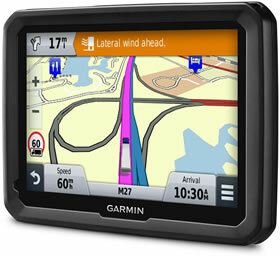 Looking for sat nav maps for the Garmin dezl 570LMT-D? All mapping comes on microSD card with SD card adaptor and is a genuine Garmin product. Areas available to buy include: Southern Africa and Middle East and Northern Africa. Question: I have a dezl 570, will the gtm 35 power cord traffic receiver work is it compatible? The GTM 35 was discontinued by Garmin several years ago and is no longer being manufactured. View all of the latest and compatible Garmin dezl 570 accessories. Do you have a question about the Garmin dezl 570LMT-D? Submit your question via our contact page.